The hubby and I just got back from a long weekend visiting friends in the midwest. Previously when we've been out there, we spent most of our time playing with their kids, swimming, boating, and other fun activities. 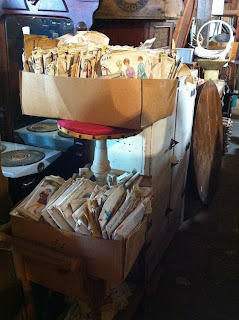 This time, I wanted to check out some antique shops. A lot of the antique shops in our area can be pretty picked over, or really expensive. My girlfriend had always told me of the great luck that she had whenever she was hunting for treasures at antique shops or yard sales in the midwest. We made a short trip out to Wisconsin to stay with her parents, and while there, we checked out some awesome shops. I picked up a few things: some tumblers, an antique brooch, and best of all, a handful of vintage sewing patterns. Boxes and boxes of sewing patterns! A really cool thread display. If only it was in my budget. A lot of our shopping made me wish I had a bigger suitcase (and more spending money), but I'm really happy with the little treasures that I left with. Looks like such a cool place, I could have been in there for hours. You are so lucky. There is nothing like that in my area. Wow so many vintage patterns. Lucky girl.